I am trying to open something in Quicktime with ".mkv" at the end on my mac computer. However, I failed, and it said this "You may need an additional video and audio decoder to play this file.". Well, I am not versed on this and already out of mind, who can aid me? Thank you! Currently, dozens of Mac users are obsessed with using QuickTime to play video files downloaded from the website or bought from iTunes, for QuickTime, developed by Apple Inc., suffices in mastering various formats of digital video, picture, sound and panoramic images. Yet, its undeniable drawback lies in its incompatibility with high definition video like the prevailing MKV file format. Typically, when you open .mkv file with the Dolby AC3 audio in QuickTime, it will inform you of installing additional audio decoder to play the soundtrack. Plus, even with QuickTime component installed for MKV playback, you will sometimes end up with QuickTime freezing error or no subtitle error since QuickTime won't handle large video file smoothly and only supports subtitle in Tx3g. 5KPlayer - 100% clean & safe to play videos in MKV AVC, H265/HEVC, H264, MPEG-4, etc without QT player incompatibility issue. Also play MP4, AVI, MOV, WMV, etc with 320+ codecs built in. No potential risk of WannaCrypt Ransomware Virus. 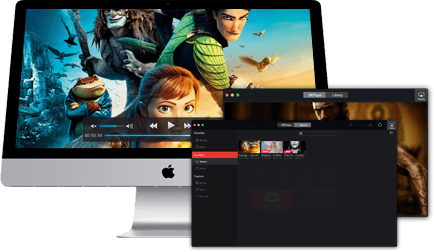 Consequently, provided that you are apt to play MKV on QuickTime on macOS with subtitles, all you need is to convert MKV to QuickTime acceptable formats like MP4 and MOV. But in a wink, you will be haunted by the ensuing problem that is how to encode MKV to QuickTime on Mac easily. Take it easy, here recommends you a professional yet feature-rich MKV to QuickTime converter for Mac -MacX Video Converter Pro to easily compress and convert video in MKV to QuickTime MP4, MOV, etc. with zero quality sacrificing in a flash. MacX Video Converter Pro is skilled in converting MKV to QuickTime MOV format with descent compression tech that enables to shrink the large MKV file into a smaller video with good quality. It is also endowed with strong power to faultlessly convert far more video formats, regardless of HD or SD videos, e.g., MKV to MOV, MKV to AVI, WMV to MP4, MP4 to MP3 and more alike, with subtitles kept at your disposal. More noteworthy is that with this all-purpose MKV to QuickTime converter, you can freely transcode MKV, MP4, MOV, AVI, or else to portable devices, such as MKV to iPhone, AVI to iPad, FLV to Samsung Galaxy S8+, MOV to Nokia and more handheld gadgets with inherent 350+ preset profiles offered. In consideration of the updating Mac users' demands to enjoy YouTube videos offline, this top MKV video converter for Mac is armed with integrated YouTube video downloader and converter feature to content the users aspiration to free watch NBA playoffs, finals, YouTube funny videos, etc. on mobile devices on the go. Step 1: Load MKV File You Want to Convert. Free download this high-end MKV video converter on Mac and launch it. Click "Add File" button to import MKV files. Batch conversion is also supported. Select the target format "to MP4" or "to MOV" button. With this Mac MKV to QuickTime converter, all the parameters of profile are avaliable for you to customize the output video like resolution, frame rate, bit rate, sample rate, etc so as to better fit portable devices. Optional: Select the Output Folder. Click the "Browse" to specify output folder to save the output files. Click "RUN" button to start to convert MKV to MP4, MOV on macOS at 250-320FPS, 5X faster than any other MOV Converter. How do you play videos like MKV on Mac? Three ways are introduced to watch high-definition MKV video files on Mac(MacBook Pro/Air, iMac, Mac Mini) perfectly. Not know how to convert MKV to H264 on Mac (macOS Sierra included) with no cost? This tutorial will tell you how to free convert MKV to H264 on Mac. Possess numerous MKV file videos and wanna convert MKV to iMovie for editing? This tutorial will show you how to convert MKV to iMovie on macOS Sierra easily. Play Any MKV on Mac (Intact or Damaged) with QT: Repair MKV & Convert MKV to MOV!